Dumart, nicknamed “Porky” by his linemates, scored 211 goals and 429 points in a total of 722 games during his 16-year NHL career from 1935 to 1954. He also won two Stanley Cups with the Bruins. Called to active military duty midway through the 1941–42 season, he and his linemates were forced to leave the Bruins in January. They became the first NHLers to join the Royal Canadian Air Force. They returned to the ice in 1945. 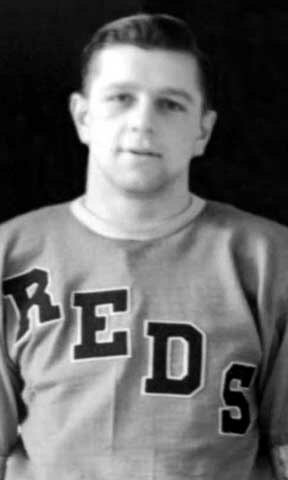 In his two seasons with the Reds, 1936 and 1954, this powerful skating left winger garnered 15 points, 9 assists and 10 PIM in 49 games.